Winter can get to be pretty serious, and you never know when the next major snow storm is gearing up just over the horizon. So you want to be prepared for whatever heavy snow fall might come your way. And the very best way to do this is by making sure you have a snow blower in your garage or tool shed that can take care of lots of snow quickly and efficiently. You want a snow blower that has the kind of wide clearance that will allow it to clear a big area in fewer passes and less time, and one that also has the kind of high intake that can deal with big drifts with no problem. But you also want your snow blower to have a powerful engine that can drive the auger through dense, icy snow, and you want it to be built from solid parts. The Murray 1695978 is the kind of serious snow blower you need to be prepared for heavy snow fall. It is driven by a powerful Briggs & Stratton engine that delivers more power to the auger and rear wheel drive so that you can cut through dense snow more quickly than ever. Briggs & Stratton is a leader in small engine design and manufacturing, so you know that you can count on that engine to last for the long term and need less maintenance to keep it running smoothly. The Murray 1695978 has all of the clearance width you need to take care of big areas quickly and efficiently. At two feet wide, you can clear the average sidewalk in just one pass, and you can get through a big driveway in between five and ten passes. And because its snow cut depth is so high, with drift cutters you can deal with the heaviest accumulations of snow that could fall in your area just as easily as you could take care of a light snow fall. The Murray 1695978 really has pretty much everything you could need on a two-stage snow blower, and it is guaranteed to last a long time. The Murray 1695978 is a gas powered two-stage snow blower that weighs just 191 pounds and has a footprint of 38 x 30 x 26 inches. It is driven by a powerful Briggs & Stratton engine that delivers enough power to drive the auger as well as a robust rear wheel drive. The auger on the Murray 1695978 is 24 inches wide, and the machine has a snow cut depth of 21 inches. It can throw snow up to 35 feet away through its manually operated snow chute, which rotates 180 degrees. The Murray 1695978 has big, durable wheels for better traction. It comes with a 2 year warranty. One of the first things you will notice about the Murray 1695978 when you get it out of the box is the fact that it comes almost completely put together, and you just have to do a small bit of finishing assembly when you get it in your home. This is very easy to do, and takes only regular household tools; before you know it your Murray 1695978 will be all set and ready to start tackling serious snow drifts. It comes with oil already included, so all you have to do is fill it with regular gasoline and you are ready to go. The Murray 1695978 does not come equipped with an electric starter, so you will have to get used to operating the recoil cord start. This is not particularly hard, though; after a few practice tries you should be able to get the hang of it pretty quickly. And when you hold the clutch and pull on the recoil cord, you will be impressed by how fast the Murray 1695978 roars to life: it is clear that there is a lot of power in the Briggs & Stratton engine that is driving this snow blower. And that is a good thing, too, because you are going to need a lot of power to drive the two foot wide auger as well as the four speed rear wheel drive. But that’s no problem for the Briggs & Stratton engine, which is one of the best in its class. The Murray 1695978 is well equipped to cut through heavy snow drifts quickly and efficiently. And because it is constructed using some of the most durable materials you can find on a two-stage snow blower, you will not have to worry about it lasting for many years. The Murray 1695978 is a solid snow blower with a lot to offer. There really is a lot to love on a snow blower like the Murray 1695978. This is a machine that is designed and built for handling very tough circumstances without getting slowed down or losing anything in terms of performance. With a high quality engine, wide clearance, and durable components, the Murray 1695978 has everything you need to take care of serious snow fall all winter long. You can clear a big area fast with the Murray 1695978, no matter how much snow has fallen. Briggs & Stratton engine : The powerful Briggs & Stratton engine on the Murray 1695978 is the feature that makes all the others possible. Briggs & Stratton is a leader in small engine manufacturing, and the 205 cubic centimeter, four-cycle overhead valve engine they have designed for the Murray 1695978 is one of the best in the business. With this engine driving your Murray 1695978, there will be no snow drift that is too deep or dense for you to get through. Extra wide clearance : The Murray 1695978 has a twenty four inch wide clearance. That is a lot of width, and it means that you will be able to clear a sidewalk in just one pass, and clear a one-car driveway in just about a half dozen. Clearance width is the feature that determines how quickly you will finish clearing your driveway, and wider is always better. At two feet, the Murray 1695978 is well above average for two-stage snow blowers. Ergonomic design : One of the best reasons for switching over to a snow blower from clearing snow by hand with a shovel is the fact that it saves your back and shoulders a lot of aches and pain. But unless the snow blower is designed well, you may wind up hurting yourself while using it anyway. The Murray 1695978 is ergonomically designed, with a user-friendly handle and rear wheel drive, so you won’t hurt your back while using it. Not too heavy : A lot of the time, two stage snow blowers can weigh a lot more than two hundred pounds, making them difficult to maneuver into and out of the garage. At 191 pounds, the Murray 1695978 is relatively light for a two stage snow blower, which is good news. That means that you will have less difficulty moving it around when it is not turned on, so you can maneuver it into a rear corner of your garage easily. Great price : Two stage snow blowers with extra wide augers, high performance engines and rear wheel drive systems can get very expensive very quickly. Often they can run as high as a thousand dollars or more. The Murray 1695978 is not one of these overpriced machines that are far too expensive for the average homeowner. It is very reasonably priced, and just about any household should find that it is in fact a very affordable purchase. As you can see, there is really a lot to like on the Murray 1695978. This is a snow blower that is packed with great features that will help you take care of big jobs more quickly than ever. With its powerful engine, wide clearance and heavy duty design, the Murray 1695978 is the kind of snow blower that you want to have in your garage when winter starts getting serious about dropping heavy accumulations in your area. With all of its great features, it may be a bit of a surprise that the Murray 1695978 does have a few areas in which it is not quite perfect. While some of these drawbacks are common problems on gas powered two stage snow blowers, others are fairly basic oversights that could easily be fixed if the manufacturer had a mind to do so. But overall, I don’t think any of them take away too much. Large footprint : For a snow blower that has a clearance width of just twenty four inches, the Murray 1695978 has a pretty big footprint. Its overall dimensions are bigger than three feet by two feet, which means that it may be a bit of a challenge to find enough storage space for the Murray 1695978 in your garage or tool shed. While the Murray 1695978 is not an overly huge snow blower, it’s still pretty big. Not CARB compliant : It is rather difficult to find a powerful two stage snow blower that is compliant with California Air Resources Board carbon emissions standards these days. Those standards are very strict, and a lot of small engine machines just don’t pass them. This is not an indictment of the Murray 1695978 necessarily, but it does mean that a significant section of readers will not be able to buy or operate this snow blower, which is a real shame. No electric starter : On gas powered two-stage snow blowers, one of the most useful extra add-ons is an electric starter. This allows you to simply plug in the machine and hit a button to get the engine going, and on cold mornings, it is much better than struggling with a heavy recoil starter cord. The Murray 1695978 does not have an electric starter, which is a pretty big drawback – it means that it may be a lot more difficult to get it going. Light on accessories : But it is not just the electric starter that is lacking on the Murray 1695978 – there are a number of other simple accessories that it does not have, either. For example, there is no headlight, which can be very useful when you are clearing snow on dark winter mornings. A number of features like the snow chute have to be manually operated. There’s no power steering. None of these are huge oversights, but they do add up. Snow cut depth could be higher : The snow cut depth on the Murray 1695978 is 20 inches high. While that will certainly be more than enough to deal with the vast majority of winter storms that may come your way, a few more inches would not have hurt at all. Of course, you can always attach drift cutters for deeper snow, but still, I would like to see a snow cut depth of at least 22 to 24 inches for serious snow fall. I think you will probably agree with me that none of these Cons present the kind of serious problems that really can take away from all of the great Pros in any meaningful way. 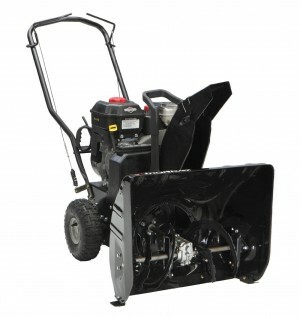 Overall, it remains one of the best two stage snow blowers on the market. But I still think it is very important to cover all of them, just so you have a good idea of what you are buying. In addition to looking at lists of the individual Pros and Cons a particular snow blower has to offer, one of the best ways to find out whether it is the right one for you is by doing some simple comparison shopping. That way, you get a good picture of how it stacks up compared to similar models made by the competition. The following table compares the Murray 1695978 with models made by Snapper and Poulan Pro. As you can see, the Murray 1695978 basically holds its own when compared to the two other models, both of which are considerably more expensive. The Murray 1695978 has a smaller overall footprint, but it has comparable snow cut depth, clearance width, and a high quality, powerful engine under the hood. If you want a quality snow blower, but do not want to spend the kind of money the other two demand, the Murray 1695978 is the one for you. I think it is pretty clear that the Murray 1695978 has a lot to offer its owner, and you probably agree with me. But before you decide to purchase this snow blower, I think it is a good idea to take one more look at the Pros and Cons lists, just to be sure it’s the right one for you. With one of the best engines you can find under the hood, a great clearance width, ergonomic design and excellent price, the Murray 1695978 is one of the better two stage snow blowers on the market today. It will last a long time and deliver solid performance. While the Murray 1695978 is a fairly basic snow blower that does not come with a lot of accessories, overall it is still a very solid machine that is going to be getting big jobs done for a long time. I don’t think any of these Cons are so serious to take away from the Pros in any way. Whether you have a big, unpaved driveway in a rural area that gets a lot of snow, or just want a reliable two stage snow blower that can take care of your suburban property quickly and efficiently, the Murray 1695978 is a great choice. It is a big, powerful, basic two stage snow blower that has everything you will need to take care of serious snow fall all winter long. It can clear a wider path than the average snow blower, which will help you finish the job sooner. It’s got a great snow cut depth that can handle most accumulations. With a powerful Briggs & Stratton engine, there is no job too big for the Murray 1695978. It has multiple forward speeds and a welded steel auger that can cut through densely packed snow like butter. It is ergonomically designed and user friendly. And best of all, it has a very affordable price tag. This is a great snow blower. As I mentioned earlier, the Murray 1695978 is one of the most reasonably priced two stage snow blowers with comparable engine size, clearance width and snow cut depth that you can find on the market today. And it offers all of this without losing anything in terms of overall quality or performance. The Murray 1695978 has a great engine that will last for many winters without needing servicing. It has a four-speed rear wheel drive that makes it easier to use. And it is built of durable parts that will not break down over time. For the price, this is one of the best snow blowers on the market today.